professional associations, hospitals, specialty societies, industry--where the daily activities of CME are carried out. This second edition is divided into six parts. The first introduces the subject, looking at it in terms of its history, its current condition, and the major role played in its conduct by the voluntary accreditation system. 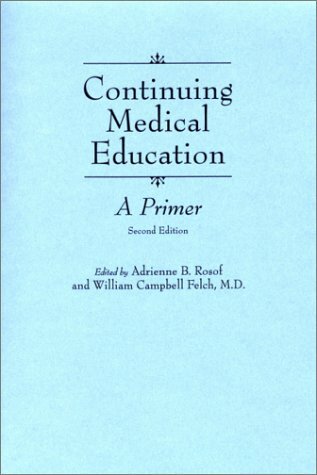 The second discusses, with suitable theoretical underpinnings, the principles of adult education and how they apply practically to CME. The third and fourth parts turn to the operational aspects of CME, first in how to establish and manage a CME office in various locations, and then relating to such general subjects as marketing, planning meetings, using the medical library, using the general resources available, and the special relationship between CME and industry. The fifth section focuses on the individual learner, including the role of peer review in identifying learning needs, both for the "average" physician learner and the special physician learner whose competence is under question. The final part offers a glimpse down the road both in terms of CME (its ethical aspects) and the science of CME (the use of informatics technology), as well as its general prognosis. Remedial Medical Education: The Problem of "Dyscompetence"